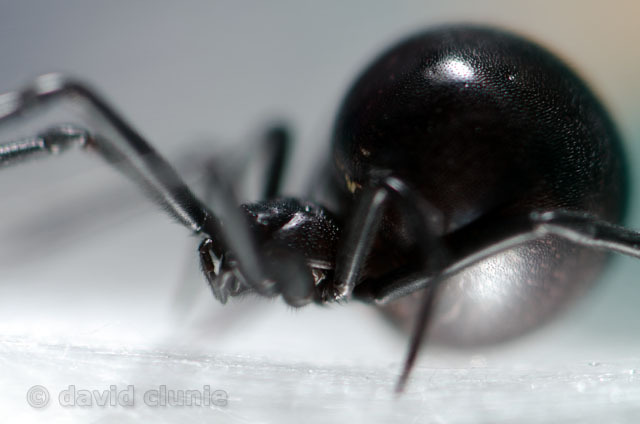 In part 1 of this series, I laid out the initial question "Do you really need that macro lens?" This post is all about lenses, and regardless if you go for the expensive or cheap, new or old school, you will need "some" type of lens to do your macro photography. More or less you'll want a lens with good glass that lets in plenty of light, the lowest aperture you can find and afford, which usually means a prime lens. A prime lens is one that doesn't have a variable focal range, e.g. no 50mm-200mm. For the new and expensive route there are plenty of choices to choose from, there is the Nikon "Micro" series of lenses and Cannon has their EF Series. Each company offers lenses of various apertures from Canon's f/2.5 or Nikon's f/2.8 and various ratios, raito is the size/magnification of the image in the viewfinder and final image, most of which are fully automatic. However when removed from the camera some of the lenses shut down to their smallest aperture and unless they have a manual focal ring you can't manually focus them, so essentially you can't use them on extension tubes, bellows, or reverse rings.The other downside is that they are pretty expensive, starting around $300 and then skyrocketing up to $2000+. With that said you can't really go wrong with any any of those lenses for straight up on camera macro photography. There are also 3rd party alternatives but those vary in quality and price. I can't really comment on the 3rd party lenses as I've never owned/used a lot of them but if you're going to go that route I'd stick with a Tamron or a Sigma. Again most of the newer lenses that have electronics, unless specified in their manuals, will be practically useless when removed from the cameras main body. Now if you're going to go with reverse rings, extension tubes, or bellows you can usually go with the old and cheap. You're going to want to find a "all manual lens", as most of the alternative products don't allow electronic connections, so the expensive "full auto lenses" will be practically useless. There are some extension tubes and bellows that do allow electronic connections but allowing those connections adds more expense, so you'll pay more. You can also find some good quality prime lenses on ebay and other reseller websites. Also don't discount pawn shops, flea markets, and goodwill stores. If you have a family member not using their equipment any longer from years gone by you might even get something handed down to you or at the very least borrowed to you. Eventually you should be able to find a decent lens for $100 or less for your camera. If you can pick up an old lens that will work with your existing lens mount then not only will you be able to use that lens for macro photography but you can use it as a regular manual lens. For example, the Nikon cameras use what is called a Nikon F-Mount established in 1959 for their cameras and it hasn't really changed much. So I can fully mount both of my old school lenses as normal manual lenses and use them in manual mode on my brand new dslr! 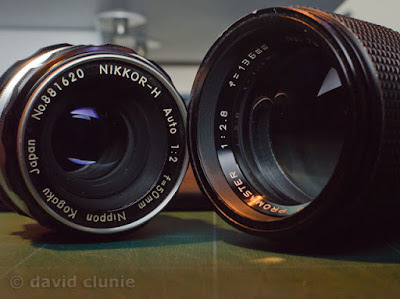 Speaking of the two lenses, shown in the photo above, one is a 50mm f/1.2 Nikkor Lens, a prime, which is the lens I primarily use. The other which I use only occasionally for macro is a 135mm f/2.8 Promaster lens. Both of these lenses are all manual. Overall you want to find a lens with good glass, older lenses may have beat up bodies but excellent optics, you can even haggle over the price because of the visual appeal, just don't let on you don't care about the looks of the exterior! Just make sure nothing rattles, the lens is free of any chips or scratches and you should be ok, but again I wouldn't pay more than $100 for an older lens so if you do end up with a dud you aren't out a huge amount and you might even be able to repair or get it repaired at a local camera shop.